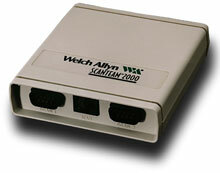 The Welch Allyn ScanTeam ST 2000 C-1 has been renamed to the Hand Held ScanTeam ST 2000 C-1. Handle a wide range of data entry chores in manufacturing, office, and retail/POS applications. The ScanTeam ST 2000 C-1 is a compact, rugged Keyboard wedge that transmits decoded barcode, magnetic stripe, and MICR data to a variety of terminals, and PCs by emulating keyboard/terminal communications. This product supports the full range of Welch-Allyn brand contact and non-contact barcode scanners, as well as magnetic stripe, and MICR readers. The ScanTeam ST 2000 C-1 can be interfaced with a variety of PCs and terminals, and a bi-directional auxiliary port allows integration of RS-232 devices such as scales, gauges, portable data collection terminals, and printers.